Loopriz is a worldwide company directory where businesses can create their free Business Card online and share their link with anyone. 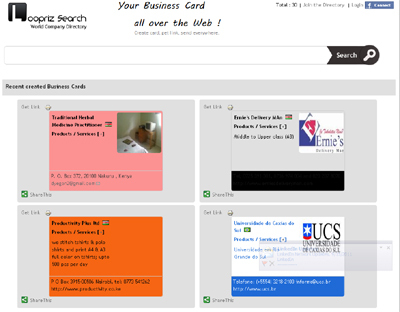 Not only does it let you share and print your Business Card but puts your business in our directory for everyone to find. It beats competition by being totally free and offering a very easy navigation and registration system with a clean design.